We love to talk to computers. I mean we love to talk to computers. We love it so much that we’re willing to believe we’re talking to a computer when we’re really not. There’s a story, probably apocryphal but totally plausible, about the early chatbot ELIZA convincing a visiting administrator that it was a truculent employee chatting via teletype. Truculence. Personality. The things people seem to share about Siri, Apple’s assistant AI, are stories about her being sassy. Turning you down if you say you love her or asking her for a joke. No one personified SHRDLU like they did ELIZA. In order for us to think of a computerized character as a person, they must show personality. They must show agency. They must do something other than what we expect. Games where folks talk at you are an esteemed but rare tradition. Usually conversation occurs in service of a larger work like an RPG or adventure game. However, games like “Galatea,” “Façade,” or Captain Blood make conversation the central part of their play. One of the reasons that this is so rare is that it is hard. Despite the fact that it’s an arbitrary bias, players are more likely to forgive inconsistencies or glitches in physical simulation than they are issues with language simulation. More than the tiniest bit of repetition, an odd turn of phrase, or the slightest hint that the character doesn’t remember a slight, and the player’s suspension of disbelief crashes to the ground. Do you know what sort of creature we forgive of all manner of odd behavior and foolishness? 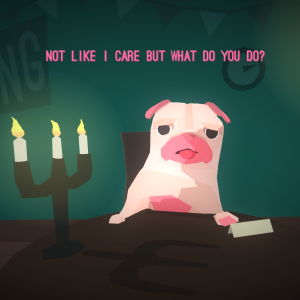 By casting its dating targets as pugs, “Hot Date” immediately sheds an enormous amount of expectation and judgment. Never mind that these are verbal, sapient dogs. Their animal nature and frankly preposterous appearance provide an excuse for any minor lapses in conversation design. The humor of the situation helps as well. We’re far more likely to forgive odd dialogue in a farce than in a drama. Limiting the conversation to three minutes also reduces the chances of the player seeing lines repeat. “Hot Date” also makes the economical choice of limiting the player’s interaction. It’s not a natural-language AI. Your own dialogue is selected from a branching menu and the responses are at least partly custom-written according to the personality of the pug in question. There’s just enough writing work here that the characters seem distinct, even though they all look identical with a small set of (very well-animated) facial expressions. Because it avoids generating or consuming natural language, there’s a lot of programming time that could be spent polishing animations and writing. I can’t be sure, but I suspect, that “Hot Date” cheats. It seems to use the technique of not remembering your actions. Pugs make it clear after your speed-date whether or not they like you, and you can communicate the same to them. However, I wouldn’t be surprised if there’s little-to-no way to affect this opinion. Certain things you say seem to anger a pug, and the worst of these may be tracked, but the vast majority of the conversation options apparently do nothing other than make the conversation feel richer. It may be that the pug’s opinion of you is determined before you ever speak to it. This post was commissioned by one of my patrons. To request posts of your own, become a supporter. Hello! I was just thinking about persimmons today, which made me remember that puzzle game about persimmons that I enjoyed many years ago, so using Google, I found Exploit, played through it again, and then have stumbled across your blog. Just wanted to say that I loved Exploit and The Majesty of Colors, thanks for making neat things. Also, I tried this pug game a few weeks back. I think I enjoy it. Awesome! Since you liked Exploit, make sure you’re following Exploit: Zero Day. We’re working on a sequel and you can get on the list to get a free alpha invitation!